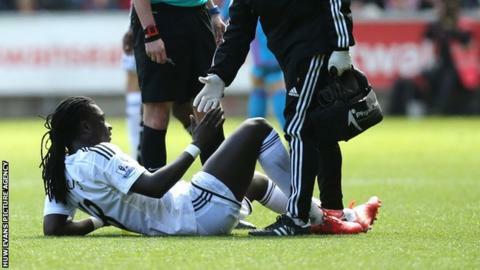 Swansea City striker Bafetimbi Gomis has been ruled out for up to four weeks with a hamstring injury. Gomis, 29, limped off during Saturday's 1-1 Premier League draw against Everton. The club says scans showed that the French forward had a "grade two" hamstring strain. "He's been very confident showing what I brought him to the club for. Obviously it's a big blow," said Swans boss Garry Monk. "I'm really disappointed for him because he was starting to hit a great bit of form." Gomis has scored just five goals in 29 Premier League appearances for the Swans, but three of those goals have come in his last three matches. In January, Gomis said he was unhappy at his lack of starts, with Wilfried Bony, now sold to Manchester City, preferred up front. But recently with more game time and an improvement in his goal-scoring form, Gomis says he is happy to stay at the Liberty Stadium. Monk could turn to on loan forward Nelson Oliveira to lead the line for Saturday's Premier League trip to face bottom of the table Leicester City. The Benfica striker is back in training after recovering from a minor foot injury. Monk also revealed that winger Jefferson Montero is also back in action after being out with a muscle strain suffered playing for Ecuador's friendly defeat against Mexico in March.